Lincoln and Leadership offers fresh perspectives on the 16th president-making novel contributions to the scholarship of one of the more studied figures of American history. The book explores Lincoln's leadership through essays focused, respectively, on Lincoln as commander-in-chief, deft political operator, and powerful theologian. 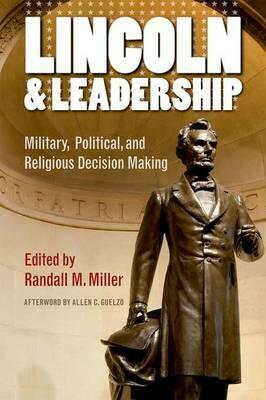 Taken together, the essays suggest the interplay of military, political, and religious factors informing Lincoln's thought and action and guiding the dynamics of his leadership. The contributors, all respected scholars of the Civil War era, focus on several critical moments in Lincoln's presidency to understand the ways Lincoln understood and dealt with such issues and concerns as emancipation, military strategy, relations with his generals, the use of black troops, party politics and his own re-election, the morality of the war, the place of America in God's design, and the meaning and obligations of sustaining the Union. Overall, they argue that Lincoln was simultaneously consistent regarding his commitments to freedom, democratic government, and Union but flexible, and sometimes contradictory, in the means to preserve and extend them. They further point to the ways that Lincoln's decision making defined the presidency and recast understandings of American "exceptionalism." They emphasize that the "real" Lincoln was an unabashed party man and shrewd politician, a self-taught commander-in-chief, and a deeply religious man who was self-confident in his ability to judge men and to persuade them with words but unsure of what God demanded from America for its collective sins of slavery. Randall Miller's Introduction in particular provides essential weight to the notion that Lincoln's presidential leadership must be seen as a series of interlocking stories. In the end, the contributors collectively remind readers that the Lincoln enshrined as the "Great Emancipator" and "savior of the Union" was in life and practice a work-in-progress. And they insist that "getting right with Lincoln" requires seeing the intersections of his-and America's-military, political, and religious interests and identities.